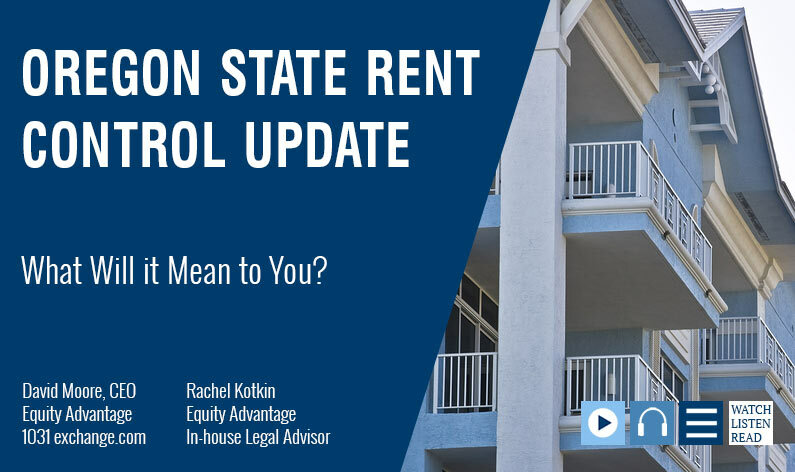 David Moore of Equity Vantage IRA Advantage discusses the Oregon statewide rent control law with their in-house legal advisor Rachel Kotkin to look at the impact of the new law on property owners in Oregon. As the first statewide rent control law in the country, Oregon Senate Bill 608 is causing a stir and has investors and those interested in 1031 exchanges asking a lot of questions. What Is Oregon Statewide Rent Control? David Moore: Can you explain what Oregon’s new statewide rent control law says? Rachel Kotktin: Oregon recently became the first state in the country to enact statewide rent control and restrictions on tenant evictions. Regarding rent control, the new legislation caps how much a landlord can increase the tenant’s rent by at 7 percent per 12-month period plus consumer price index. With regard to tenant evictions, there are new restrictions on when a landlord can evict a tenant and for what cause. Now it either needs to be based on tenant cause or landlord cause, and if the eviction is based on a landlord cause, there are new requirements for relocation fees that the landlord would need to pay a tenant. David Moore: You’re on client calls daily with people from all over the country. Have you had any feedback from any of the clients you’ve spoken with so far? Rachel Kotktin: A lot of the clients that I’ve spoken with have concerns about how this is going to impact their ability to manage or run their property if they are an existing landlord or even the thought of moving property into the state of Oregon, either through an exchange that they’ve got set up, are looking to initiate. A lot of the concern sounds like this: Why would I want to move my funds and exchange into a property located in the state when there are now these new restrictions on what I as a landlord can do with my own property? David Moore: Interesting. And they may be some fear out there that other states might follow suit and put something in place. Where Will Oregon Statewide Rent Control Leave You? Rachel Kotktin: Yes. Citywide rent control is not a new thing, but to have it be statewide has been unheard of until now. This kind of sets a precedent that what’s best for one particular city Is best for the whole state, which may or may not be a policy we want to get into. David Moore: One thing I’ve noticed through the years as we’ve had states sort of fall in or out of following 1031 is that typically when a state decides they’re not going to follow the federal guidelines and honor state deferral on 1031, then that state ends up in sort of a vacuum. Many years ago, there was a case where Oregon would tax, people would not honor it on the state level for non-residents, but would on the state level for residents and a taxpayer actually took the state to court and cited the Oregon State Constitution, which prohibited discrimination between residents and non-residents. They overturned it. But we’ve seen that definitely through the years. From my perspective, I’ve had a number of current and potential clients that were looking to come here and it’s definitely changing the way they look at things. David Moore: Obviously there are always going to be winners and losers. The main objective of all this is to provide housing for people, and it’s going to be very interesting to see what the ultimate impact is. I don’t see a lot of people from the investor and development side excited about this. In fact, I haven’t spoken with anybody yet that’s excited about this, so hopefully it works and takes care of people. Historically it has not done so. David Moore: You’ve published a paper on this, Rachel, and it’s in our newsletter. If you’re not already a subscriber, you can sign up on our website.